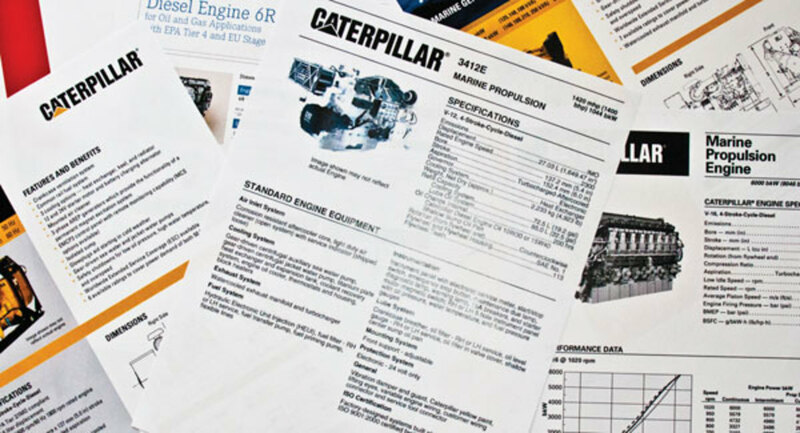 Engine spec sheets can provide a lot of useful data if you know how to read them. 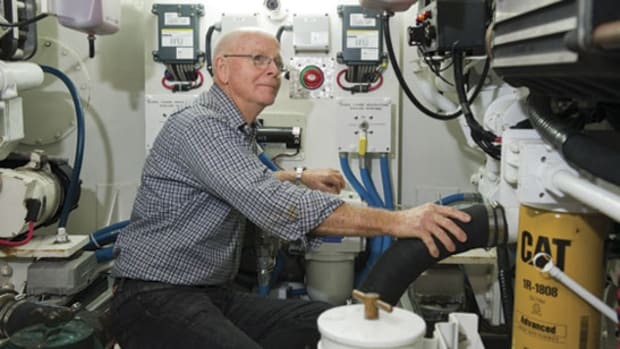 If you’ve ever cruised the engine booths at a boat show you’ve no doubt become acquainted with the diesel-engine spec sheet. Maybe you’ve even stuffed a few into your shopping bag, and if you’re a real boat nerd, you may have actually pulled one out and tried to make sense of it. That’s no mean feat as these things can be intimidating, if not downright indecipherable. There’s a lot of data. 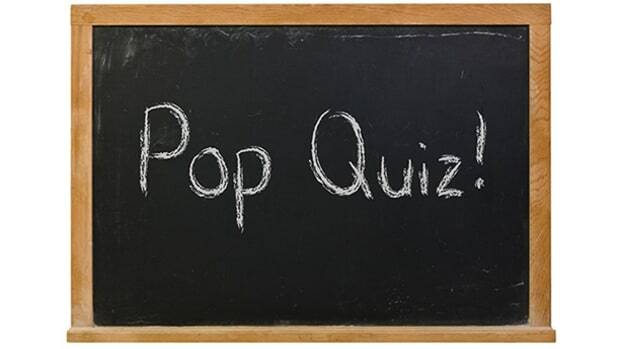 The questions are, what does that data mean and is it of any real value to you? Before I answer those questions let me caution you that the term engine spec sheet is something of a moving target. There is neither a standard format nor a baseline of required info. A spec sheet contains whatever a particular manufacturer decides to put in it. And not only do they vary from manufacturer to manufacturer, but even from year to year and engine to engine. If there’s method to this system I’ve never been able to discern it. 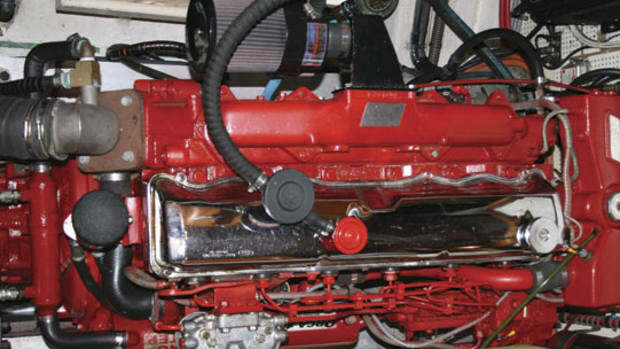 Most spec sheets begin with the basics, like “engine type” or “configuration.” This tells you the number and arrangement of cylinders—i.e., “in-line six-cylinder”—and the aspiration, which indicates whether the engine is turbocharged or turbocharged and aftercooled; if the engine is neither, it will be described as naturally aspirated. 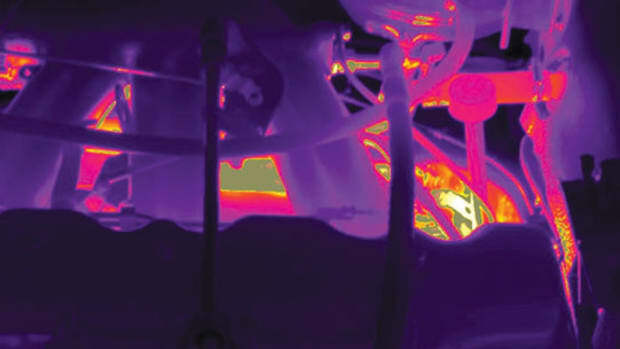 Aftercooling, by the way, is a method of cooling the air coming out of a turbocharger before it enters an engine, which increases the air’s density and allows the addition of more fuel. Aftercooled engines are generally more powerful than engines that are only turbocharged. The sheet may also indicate that the engine in question is a “four-cycle” engine, which refers to the type of combustion cycle. 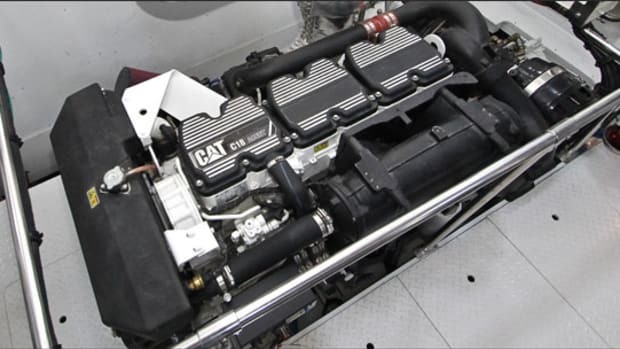 All modern pleasurecraft diesels use the four-stroke cycle, usually shortened to just four-cycle, or four-stroke. Also among the basics will be the engine’s bore and stroke, which are respectively, the size of the hole in which the piston moves and the maximum vertical length the piston travels on each stroke. Multiply the bore and the stroke by the number of cylinders and you have the engine’s internal displacement, usually measured in liters and/or cubic inches. The next section typically provides external dimensions and weight, which may or may not include the marine gear. 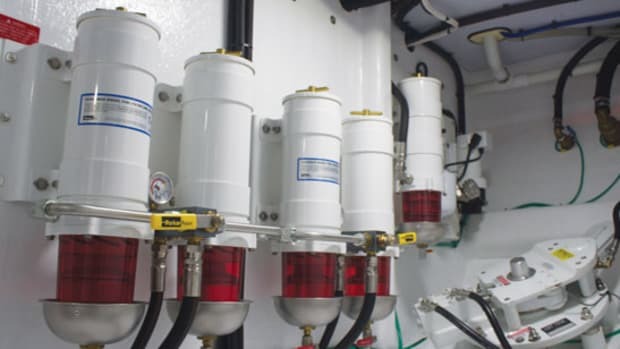 Some sheets denote height, width, and length in inches and millimeters while others provide scale drawings of an engine’s front and side along with the dimensions, giving you a picture of how the engine will fit in your boat. The importance of external dimensions and weight is fairly self-evident; suffice to say that engine manufacturers are constantly trying to minimize all of them. The amount of horsepower an engine generates based on its physical dimensions is called its power density; the amount of power based on its weight is its power-to-weight ratio. Today engine output is typically specified in metric horsepower along with a conversion to kilowatts. Output may be measured at the crankshaft, in which case it is called brake horsepower, or at the output shaft of the marine gear, in which case it is called net horsepower, which will be lower due to frictional losses. Make sure you compare engines using the same type of output. A particular engine model is often offered in a variety of power ratings, and these may be listed on a single spec sheet, or each power rating may get its own sheet. 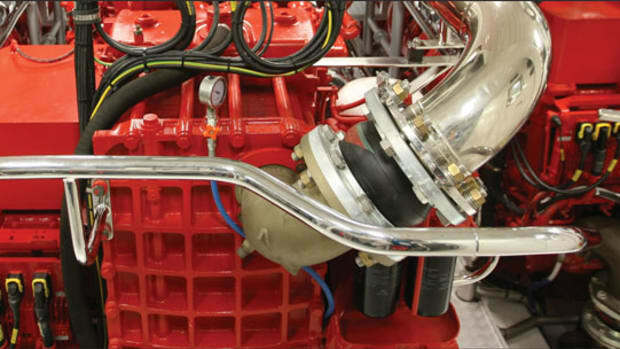 For its QSC8.3, Cummins provides a chart that shows three horsepower ratings along with the engine rpm at which that output was achieved plus the fuel consumption at that rated speed in both liters and gallons per hour. 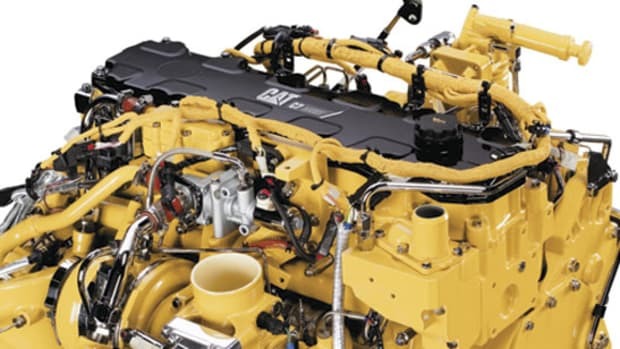 For its C18 ACERT, Caterpillar provides both a chart and a graph, while for its D11-510, Volvo Penta provides only graphs. Some manufacturers also provide a figure called the brake-specific fuel consumption, which is the amount of fuel required to produce one horsepower for one hour; it provides a meaningful way to compare engine efficiency. Those spec sheets that utilize graphs may provide individual ones for horsepower, torque, and a propeller curve. Torque is the twisting force that turns the propeller and thus is important in determining how quickly a boat planes. In looking at a graphic representation of torque check to see how early an engine makes its maximum torque (called torque rise) and how long it can maintain that output. Generally speaking, the earlier and longer, the better. 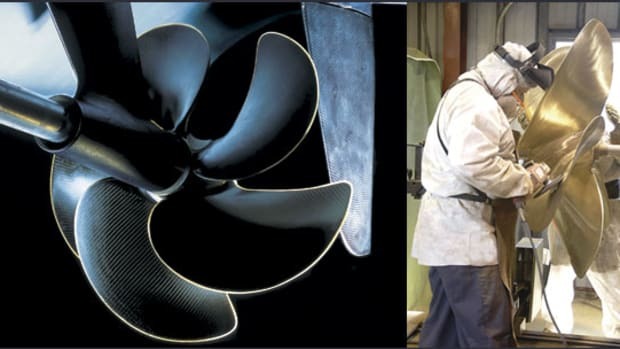 A propeller curve is a theoretical construct designed to approximate how an engine will perform when it is connected to a propeller, as opposed to being connected to a dynamometer. While this information can be helpful, it does not take into account differences in hull design or vessel displacement. Finally, some spec sheets indicate allowable operating parameters for a particular engine rating. If an engine has a continuous-duty rating, there are typically no restrictions on how long you can operate it at full throttle. For most high-performance diesels you are allowed to run at maximum rpm for a limited percentage of running time; if you exceed this, the manufacturer can void the warranty. Modern diesels have software that records operating history so you ignore these guidelines at your peril.